All trapping licenses are issued from the Maine Department of Inland Fisheries and Wildlife office in Augusta. Trapping license cannot be purchased online. A trapping license remains valid from July 1st through June 30 of the following year. Maine residents under 10 years old may trap without a license, except bear. An individual must be at least 10 years of age to trap a bear. 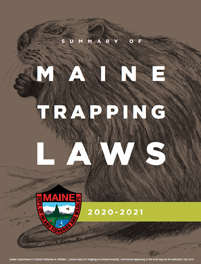 Maine residents who are 16 or older, must have a resident trapping license (see resident landowners below). Resident landowners, and immediate family members may trap without a license on their own land as long as their license to trap is not under revocation or suspension, if they actually live on that land and the land is used only for agricultural purposes. If you trap for beaver, you must have a trapping license. Nonresident Aliens: Nonresidents who are not citizens of the United States (nonresident alien), are not allowed to trap in Maine. Apprentice License: An apprentice trapper license allows a person who has never held a valid adult trapping license to go trapping with an adult supervisor for up to two years without having to take a trapper education course. An "adult supervisor" is one who has held a valid adult trapping license for the prior 3 consecutive years. The holder of an apprentice trapper license must, while trapping, be under the direct supervision of an adult supervisor at all times. An apprentice trapper license allows a person to trap for all species that may be legally trapped, except black bear. The fee for an apprentice trapper license is the same as a regular trapping license. If registered to vote, is registered in this state. If licensed to drive a motor vehicle, has made application for or possesses a motor vehicle operator's license issued by the state. If owning a motor vehicle located within the state, has registered each such vehicle in the state. Is in compliance with the state income tax laws. * A trapping license is also required. When applying for any Maine trapping license (except a junior license), proof of having successfully completed a state-approved trapper education course is required or proof of having held an adult trapping license (in Maine or in some other state, province or country) at some time since 1978. See Outdoor Safety Courses. Children under 10 years of age are allowed to trap all legal species, except bear, without a license but must be accompanied at all times by an adult supervisor. Children over 10 years of age and under 16 years of age who hold a junior trapping license must be accompanied, unless they have successfully completed a trapper education course. The person who accompanies a youth trapper is responsible for any violations committed by this trapper. "Adult Supervisor" for a junior trapper means a parent or guardian of the junior trapper or a person 18 years of age or older who is approved by the parent or guardian of the junior trapper and who holds or has held a valid adult trapping license or has completed a trapper education course. Do you need to take an outdoor safety course to obtain your license for firearms, archery, crossbow, or trapping? Maine law requires completion to obtain your adult license unless you have previously done so or have held an adult license. These courses are made available in your area by volunteer instructors certified by the Department of Inland Fisheries & Wildlife. Pre-registration is requested and/or required. Courses will include 6 to 12 hours of instruction dependent on the subject. Sponsors include school districts, sports clubs, civic groups, and others. Courses will be scheduled based on instructor availability. For information on becoming a volunteer instructor, contact your local Regional Safety Coordinator or the Recreational Safety Division Office at (207) 287-5220. For course listings, see Trapper Education Courses.